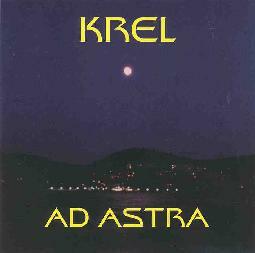 After several years of cassette recordings, Krel released their first CD, Ad Astra, last year. The following interview with Martin M. was facilitated by Andy G of Dead Earnest Records, Krel's label. AI: Has Krel been continuous since the late eighties? AI: Is Ad Astra essentially Martin with guests, or a band effort? MM: I suppose it's mainly a solo project with guests. AI: Tell me about your musical goals and how does Ad Astra differ from earlier releases? MM: I suppose Krel music is "festival music", a sort of communication to like-minded people who are not ready to accept the corporate package. Independent music allows the freedom to be yourself and, more importantly, develop new things. Our main goal right now is live gigs, especially outside England, and to play till we drop. The new stage show is also something on which we are working, but it could take a while before the design and manufacture of the androids is complete, but the whole thing will grow alongside the band. The main difference between Ad Astra and earlier efforts would be the lack of other musicians and the situation at that time, when people needed were not available, and so I ended up playing most of it myself. All of Ad Astra was recorded on a 4-track cassette, as were all Krel releases, except for 'Earth Zero'. AI: Did you begin as spacerock musicians or did your interests veer there from other directions? MM: On a personal note, it stemmed from 1978 when I first heard Hawkwind and learned to play guitar. Together with Dave Nolan, I formed a band called Moonstone, playing Hawkwind covers and original material, and I guess that was where Krel originated. AI: I understand one of your first cassettes was a Hawkwind covers tape. The Hawkwind influence in your music is clear. But to me, Ad Astra has a definite sound of its own. Do you feel that people hear more Hawkwind than is really there? MM: Thanks for the comments. I hope Krel has got a sound of its own. I guess that some people do just think Hawkwind when they hear us, but they have their own sound and it's a big part of the spacerock scene. To me, they are THE band in terms of actual spacerock, but the other day someone who had not heard Hawkwind, described Krel as sounding like Ozric Tentacles, so I suppose it depends what you already know as to how you'd compare us. But we all love Hawkwind, so we can't resist dropping in the occasional riff here and there. AI: You've been releasing cassettes for several years. Tell about your experience in the cassette underground and what successes or limitations you feel accompanied it. Various live gigs still waiting to be sorted. The success of the underground tape scene is the fact that you can get your music out there to people who make the choice of what they listen to. Just about all the people with whom we have dealt have been great and not ripped us off - not that it's a good money career, but getting your music out is what it's about. The more independent the distributor is, the more freedom they have to choose what they want to put out, and so we all get the chance to hear music that would, under any other conditions, not get issued. AI: Has the release of Ad Astra as a CD been a leap ahead for Krel in terms of exposure? MM: Well, yes, Ad Astra has found its way all over the world thanks to Andy G at Dead Earnest and it's all sytems go from now on. AI: How about live performances? Has Krel played any live shows since Ad Astra? Plans? MM: Well, for me the most memorable show was in 1992. We had two dancers who wore themed costumes for individual songs and a fantastic light show (AN ARK LIGHT). We made the costumes from whatever we could get, and my brother David got to work on creating the electronic circuitry for the android costumes. Jason and Siobahn, the dancers, created their own moulded headshapes and bodies from "paper mache" to create their android costumes for the show. It went from androids to spirits draped in fine ultraviolet mesh, an Egyptian statue staring blankly from the stage and slowly becoming a tourist photographing the audience, before turning into a lizard. We had just about all the equipment as well as our faces and arms covered in paint. I have done a bit of stuff with other bands here and there but Krel have not played any gigs since Ad Astra. However, that is soon to be remedied, 'coz the new live band is just about ready for lift-off. AI: How is the live SpaceRock scene in Manchester? MM: VERY VERY SAD. It's got much worse, but that's the way it goes. We hope to change it soon and there are still a few good bands out and about. We are hoping to get the Krel Experience going on in this area soon, welcoming other bands as soon as we get our own ship into shape. AI: Any musical projects outside Krel? MM: Really only studio work that would be hard to adapt for a live show. It's more experimental, from ambient to "cyberKrel". However, Krel is my main focus of attention right now. I'll try to let you hear some of this studio music when there is more of it knocked into shape. AI: Future plans? MM: Many. We're planning our new CD at the moment and busy getting the live stuff worked out. Hopefully, you'll see Krel over there soon. Dead Earnest was set up as a vehicle just to release the Krel CD. When Martin sent to me the original re-done version of Ad Astra, I felt that it was pointless hawking it to others as I could do as decent a job of promotion with it myself, having been in the forefront of specialist mail order and the indie scenes in general for a number of years. When I heard the finished copy of it, I was amazed and felt that this was an exceptional CD from the spacerock scene, even compared to the previous cassettes that were ahead of their time anyway. It is the intention to issue on CD as many of the previous cassettes as possible over the next few years but this depends on many factors and will only happen when there is an appropriate gap between new material, assuming no-one from the line-ups vetoes the project and the quality of the source material is OK.
At the same time that the Krel album was delivered to me originally, Martin also sent a proposed solo album of original instrumental material, a piece in three parts that was essentially 90's ambient music but very different from a lot of what passes for that these days. Had it not been for the over-use of didgeridoo sounds in part 2, it would have been excellent to put out. But it is a project and a separate side of things that we shall resurrect in the next year or two. Widening the horizons a little, the success of the Krel CD has allowed me the luxury to sign Spacehead to Dead Earnest. Spacehead is led by Mr Dibs who was originally alongside Martin in Krel and, as many of your readers know, have had a CD out on EBS. Having helped Spacehead right from the first cassette, it was almost fate that Dibs and I should ultimately get together and so the next Spacehead CD will be out this fall. Your readers will be the first to learn that it will be a summary of the various bands' activities since the first CD came out and will so far consist of side one of the 'Anasazi' tape, plus a selection of live and new studio tracks, of which at least one will feature the current line-up of Dibs on bass and vocals, ex-Gong member Graham Clarke on lead guitar and occasional violin plus Kenny on the drums. At present Spacehead are looking for a synth player to complete the line-up and then it's back on the road to promote the new CD. Having seen the trio do a recent concert I can say that they are shaping and working a new style of space rock with Graham doing an almost Robert Fripp-like role within the band, with searing solos, sonic textures and even Gong-style glissando guitar. This leads on to give my opinion that, while it has to be said that Hawkwind have always been at the top of the spacerock tree, and while rumours of a current reunion tour for '99 are rife, I do feel that the time is now more right than ever, on both sides of the Atlantic, for the new wave of spacerock and modern psychedelic bands to rise up and be counted, and providing the audiences everywhere come to this situation with open minds, they will find a wealth of great music and bands to follow who are now, and will in the future, provide just as many highs as Hawkwind did, and occasionally do now. I really do feel that both Krel and Spacehead in the UK and bands such as the amazing F/i and Alien Planetscapes in the USA, can achieve some degree of the mass acceptance that Hawkwind have had over the years by getting out there and appealing, not only to the fans, but to a new audience who never grew up on Hawkwind and who will be knocked out when they see the bands in concert. My hopes for 1999 include continuing to promote Krel and Spacehead in concert and on CD, get to Europe and the USA, organise a day or weekend UK festival involving synth, contemporary and spacerock artists, promote my latest signings, Mooch, whose CD will be out this fall, hope that the fans of genres such as Krautrock, Spacerock, electronic, etc all decide to look forward rather than back and get into the new bands rather than forever collecting remasters, rehashes and oft-too expensive so-called collectors items of the old ones, and to get a review of any of my label CD's in any of the decent national indie mags in the USA, UK and France. To end, can I thank Aural Innovations and all the indie mags worldwide for their support and tireless efforts as the champions of the best in new music around in the world today that is too long ignored by the world at large. You can visit Krel and check out other great bands on the Dead Earnest label by visiting their web site.